Spring break is over. The inner track is closed. The Wood Memorial is less than a week away. All the signs are there…but spring is staying stubbornly away from New York, and if, as the weather forecast indicates, April showers bring May flowers, they will most certainly not bring turf racing back to New York, despite the races carded for the grass later this week. 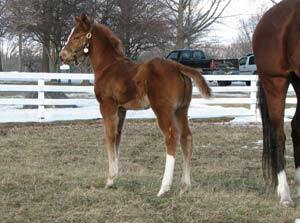 Another sign of spring is the sight of foals gamboling in their fields, and the folks at the New York-Bred newsletter have obligingly provided us with plenty of photos of foals in their on-line Foaling Barn. Check out babies by Bernardini, Hook and Ladder, and New York leading sire Freud; this perky filly is by Friendly Island, out of Distinctive Miss, and she was foaled on January 11th at Sugar Maple Farm. A month from yesterday, racing moves from the winter track at Aqueduct to the green (we hope) of Belmont, and in light of the MTA’s decision to ax the train to Belmont, PowerCap has helpfully offered a walking map from the closest train station to the track. Save this; you’ll need it. 1) Take the A to Jay Street, transfer to the shuttle bus to Utica Avenue, and then get back on the train. 2) Take the L to Broadway Junction and transfer there to the A.
I’m not sure how much longer it will all take, but I’d plan on at least an additional thirty minutes. Finally, in an utterly bizarre instance of worlds colliding, this morning at church the sermon used as its starting point Jack Dreyfus’s recent death. There wasn’t a lot of racing content, but I gotta tell you, the priest sure got my attention when he began, “I want to read to you from Jack Dreyfus’s obituary in the New York Times.” Amen! Ugh, the shuttle bus. Have you seen the stop at Jay Street? Squalid. For those feeling flush or confident of a great day at the windows, a cab to Aqueduct from Court Street is about $50, including tip. I may splurge this Saturday. Very useful information on the walking from Queens Village-so a big thank you to Power Cap and your link to it.I hope racefans will carry on taking the train and walking from Queens Village-or taking the bus from Jamaica that goes straight to the track. But I worry that casual fans won’t want to change at Jamaica and then walk 14 minutes-and will head southwards on a direct NJT service to Monmouth ParkAnd then there’s the absolute unknown of the new direct service from Penn Station and Newark to Atlantic City at the weekends. Will both tracks lose out as a result of this? Jess: I wonder about a carpool Zipcar? Any cheaper?Jeremy: so nice to see you back and commenting–welcome back! Great questions about the lack of train service and the ease of getting to Monmouth/Atlantic City. I know that I loathed the train to Belmont (too slow, too many transfers) when it dropped me off right at the track–will people just bail now that it’s that much more difficult? Did the train definitely get cut? I can’t find anything about it for sure. And I’m having a big party there on Derby day, chosen specifically because of the transit option…UGH! Thanks for the link to the Foaling Barn. I loved looking at the photos of the new foals. Some nice looking colts & fillies there. keep me posted on the car pool zip car idea… the A train running on a regular sched was enough to keep me from the Big A.
Belmont train cut isn’t quite final yet. Albany has less than a week to enact the Ravitch rewscue plan for the MTA, which would avert service cuts. Don’t hold your breath, though. Dana–I’ll be driving the Backstretchmobile out there that day–not yet sure what time, might be early. There’s room for at least one more, maybe two. Let me know if you’re interested. Steve: thanks for the info. Maybe you’ll be in luck, SKL?Elizabeth: Aren’t they amazing? I love that the NY bred newsletter sends them out.